Description: Back before 632 became A&M 57. Description: A&M 54-14-632 bring their train over from Van Buren on the UP trackage next to the A&M yard. Description: Pushing hard against a short cut of cars in the former SLSF yard. Description: A&M 54 pulling the last passenger excursion of the day. Description: A&M 54 backs down the main to pickup more hopper cars to store. Title: The Monett Turn heads south. 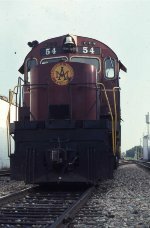 Title: AM 60 & Co up from home at the Schreiber plant crossing sitting idle waiting for entry. Title: Just Gotta Love Them ALCOs! Description: As the local is heading to Monett, the set of ALCO C-420s wait in Monett. Description: Old and new meet as the local pulls along side the A&M power. Description: The Monett turn leaves Monett and moves upgrade. Description: Highballing up the grade - SMOKE TIME! Description: The Monett Turn soon moves thru the S curve at Purdy.